Tag: A Synopsis of the Birds of North America. John James Audubon was born in Les Cayes, in what is now Haiti, on April 26, 1785. The illegitimate son of French plantation owner Captain Jean Audubon and his Creole servant Jeanne Rabin, he was given the name Jean Rabin at birth. However, when his mother died shortly after his birth, he and his sister were sent to Nantes, France, where they were raised by the captain’s wife, Anne. The couple legally adopted the children in 1794 and gave Jean a new name: Jean-Jacques Fougère Audubon. The above image is available for custom reproduction from RequestAPrint. All sales benefit the Peabody Institute Library. By 1824, Audubon had grown intent on finding a publisher for his work, but was unable to generate any serious interest in the United States. Two years later, he set sail for the United Kingdom, where he hoped to at least be able to find engravers skilled enough to properly reproduce his work. The decision immediately proved a good one. He exhibited his work in both Scotland and England to great acclaim, fascinating the public with his impressive drawing skills as well as some tall tales he relayed about life on the American frontier. The success of his exhibitions would finally lead to the first publication of the book for which he is now best known: Birds of America. Featuring more than 400 plates of his drawings, the four-volume work was printed in London by Havell & Son in 1827 and serialized until 1838. Accompanying it was Ornithological Biography, which featured text about the lives and behaviors of his subjects as well as highlights about Audubon’s adventures. He followed these seminal works with 1839’s A Synopsis of the Birds of North America. Throughout this period, Audubon traveled back and forth between the United States and Europe, overseeing the publication of his works and also selling them in popular serialized subscriptions to admirers who included King George IV and United States President Andrew Jackson. His fame and fortune firmly established, in 1841 Audubon moved his family to a large rural estate on the Hudson in upper Manhattan, where he began work on a more compact edition of Birds of America. 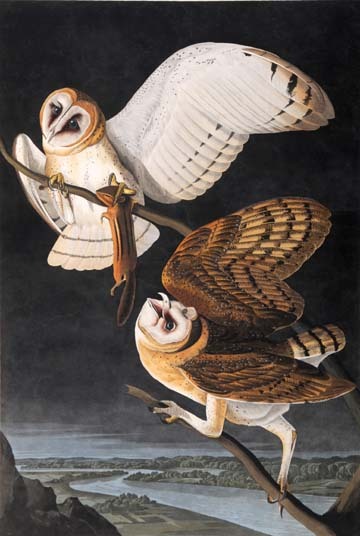 See the whole John James Audubon gallery from the Peabody Library Institute here.